TotalSim have a wealth of experience in aerodynamic development, building upon our roots in Formula 1. TotalSim have got it covered – TotalSim Aerodynamic Consultancy. TotalSim have had clients in nearly every form of motorsport. We can take the roll of lead aerodynamicist or as a virtual wind tunnel. The virtual route of aero development is significantly cheaper, more efficient and faster than scale and full size testing. Using CFD for automotive aerodynamics is a proven and efficient route for development. TotalSim have recently launched a Motorsport specific minisite. Follow the link to find out more. Automotive drag reduction exercise for Swift group, using CFD to maximize aerodynamic efficiency. Commercial vehicle and road car aerodynamics is becoming more import as fuel prices increase. Reducing drag and making vehicles more aerodynamic is something we at TotalSim do everyday. From road cars and caravans to race cars we can help with our aerodynamics consultancy services using CFD as the backbone for development. With our kinematic ride height changer we can automatically move your vehicle into a range of attitudes, helping create a robust design. We also have extensive experience in mapping, to help predict the performance through changes in yaw, roll, steer and pitch. This helps to create a robust aerodynamic solution, maintaining aerodynamic performance throughout operating ranges. 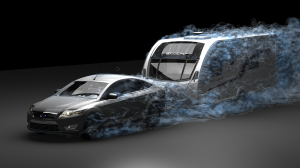 Aerodynamics – TotalSim can help with just about any form of vehicle.